The flag of the Town of Portugal Cove - St. Philip's, Newfoundland and Labrador, is a Canadian styled vertically divided in three fields blue-white-blue. In the middle of the white field the town coat of arms id positioned. 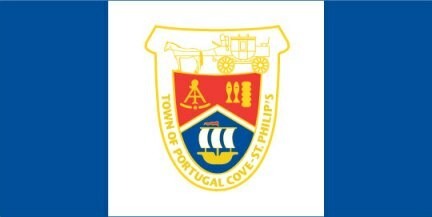 "The Coat of Arms for the Town of Portugal Cove-St. Philip's, which is also featured on the town's flag, contains the same colours as those in the flag of Newfoundland: red, white, blue and gold. The shield is mounted by a stagecoach and horse, is surrounded by the Town's name, and is divided by a white chevron. The sailing ship in the center is a symbol used to represent maritime people who live off of the sea. It also represents the landing of Gasper Corte Real in Portugal Cove. The stagecoach on the top of the crest represents the connection between St. John's and Portugal Cove. This connection was important as ships were operating between Portugal Cove and Harbour Grace, which was the home of the Governor of the Colony of Newfoundland. The sextant on the left side represents one of the earliest cartographic efforts in North America; a 1774 map-making survey off the coast of Conception Bay in the vicinity of Broad Cove. As the Town of St. Philip's was named after St. Philip, a provisionary for Jesus, the symbol of two fish and five loaves of bread were chosen to represent this part of the community. These symbols combine to represent events of historical significance to the area, while also illustrating the unique character and geography of the area." Image of the flag and information thanks to Sheree Kent, Executive Assistant.